The last, and best of the Old Surhand Karl May Westerns, with Stewart Granger and Terence Hill. UFA German R0 boxset disc. When a gang of bandits commanded by 'The General' rob a payroll train, two of the group are sent to kill some Buffalo in the hope that this will enrage the local Comanche tribe and see them blamed for the attack - however events spiral out of control when the son of the Comanche chief is killed in Mason City, while trying to tell the townspeople who was really behind the killings, and the tribe declare a new war on the white men. Old Surehand (Stewart Granger) gets caught up in the case, when he learns that 'The General' was behind the death of his brother, and is helped by Judith whose Uncle is killed by the same bandits, after his goldmine, and her friend Toby (Terence Hill) - a town clerk who becomes jealous when Judith starts to swoon over Surehand. The seventh of Rialto Studio's nine Karl May Westerns, Old Surehand is the last of the Surehand films. Originally conceived as a lower-budget and grimmer parallel series, to target a more mature audience, the previous Surehand films (Under Vultures and The Oil Prince) had been relatively small affairs compared to the near-epic scale of the Winnetou/Shatterhand films, which boast many scenes that would rival the biggest of the American Westerns. Although Old Surehand is still not to the scale of the Shatterhand films, it does contain several large scale sequences - although as with the previous two films, there is much more of a classic Western feel than the adventurous tones of the Shatterhand films. The storyline is surprisingly convoluted, with the antics of the General's gang beginning with a simple train robbery, and spiraling into an attempt to provoke an all out war - we then find Surehand's involvement as he continues to search for his brother's killer, whom he discovers (not unexpectedly for viewers) is The General. Unfortunately, this storyline comes off as rather compressed into the film's 90 minute run-time, and events like the destruction and robbery of the train are not mentioned again - however, this does mean that the film's pacing is relatively quick, compared to most of the other films in the series, and it never drags. Despite the fast pace, characterisation is strong - among the best in the series, with Terence Hill's initially mild-mannered Toby being an interesting variation on the usual 'heroic young men' played by Götz George, and his development throughout the film is well written - the love story between him and Judith comes off much better than the rather generic love stories in most Westerns. Unfortunately the rapid pace of the film means that Winnetou and The General don't get enough screentime, but time is given over to some nice, tense scenes - some of the best in the series. Given the grimmer tone of the Surehand films, a lot of innocent people die, and the classic Karl May theme of deadly goldlust is plenty evident here - however, there is still some light humour (most notably in a comic barfight) and it is not as grating as the "eccentric Englishman" humour of many of the Shatterhand films. Ultimately the story builds to a strong climax with a solid conclusion. Alfred Vohrer does a good job here - both large scale action, and smaller dialogue scenes are well shot and edited - the production values are strong, with some large casts of extras - the opening scenes including an attack on a train, and the explosion of a full scale rail locomotive, are notably well shot and produced. As usual, Martin Böttcher provides the soundtrack and it fits well. Stewart Granger looks very confident in the third playing of his Old Surehand role and brings gravitas and realism to the performance. A young Mario Girotti (better known as Terence Hill) gets one of his largest roles in the series here, and gives a convincing performance as the mild mannered Toby, working well alongside the attractive Letícia Román as Judith. Pierre Brice gets little to do as Winnetou, while American actor Larry Pennell gives a good, if brief performance as 'The General'. Old Surehand despite its original German title (Surehand part 1) was the last of the Surehand films, and among the last of the Karl May Westerns, their attempts at becoming grittier had been surpassed by Sergio Leone and company in Italy, and despite good reviews, Old Surehand was the first of the series not to win the Golden Canvas award for 3 million plus domestic viewers. However, it remains a good film, and among the best in the series boasting some good set-pieces, a decent storyline, strong characters and good acting all round. Highly recommended to fans, although not the best place to start watching. Letícia Román - the young female star of Mario Bava's Girl Who Knew Too Much (1964). The image is very good - almost no grain, with great colours and detail. English mono - sounds fine. 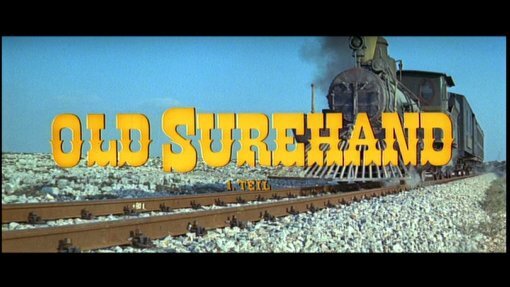 Documentary on the Surehand films, including interviews with various actors, including Götz George Pierre Brice, with lots of clips. (20 minutes) German only. Documentary interview with producer Horst Wendlandt (18 minutes). German only. Original trailers for all the Surehand films. Stills photo gallery for all the Surehand films. EASTER EGG: A scene showing the restoration process and some interesting original camera negative from Under Vultures. An attempt to add some variation to the franchise makes this dark and interesting film, worth watching. A good looking release of this film with a decent English audio track and some interesting bonus features. All text in this review written by Timothy Young - 25th November. 2006.